Bob Cameron was born July 18, 1954 in Hamilton, Ontario. Before joining the Winnipeg Blue Bombers, Cameron had an outstanding varsity career as quarterback with the University of Acadia Axemen. While at Acadia he lead the team to two Vanier Cup appearances and in 1977 won the Hec Crighton Award for most valuable player in Canadian College Football. He is the first Hec Crighton winner to be inducted into the Canadian Football Hall of Fame. Cameron was signed by the Winnipeg Blue Bombers in 1980 and played his entire 23 season career with the team. Rarely missing a game, he became a symbol for consistency and reliability. At the time of his retirement, Cameron held the record for most consecutive games played with 353. Through out his career Cameron’s punting performance earned him numerous accolades including being named a Western All-Star six times and a Canadian All-Star four times. He helped the Blue Bombers to six Grey Cup appearances and three Grey Cup victories. He was named the Most Outstanding Canadian in the Grey Cup for his performance during the 1988 game. In 1988 and 1998, he was Winnipeg’s nominee for Most Outstanding Canadian. 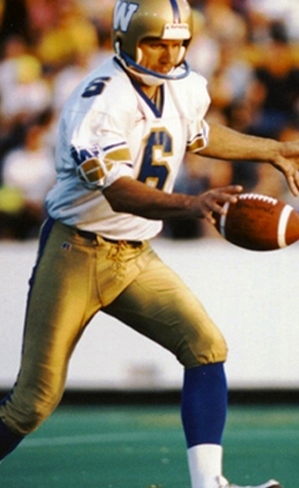 Bob Cameron kicked over 3,000 punts during his CFL career. At the time of his retirement, he held the majority of punting records in the CFL including most punting yards all-time regular season with 134,301 yards. During the 1988 season he set the records for most punting yards regular season with 8,214 yards and most punts regular season with 188 punts. He was inducted to the Winnipeg Football Club Hall of Fame in 2003.